150XL037 TIMING BELT. BANDO Industrial Grade 150XL-037. 150XL037 Bando Synchro-Link Timing Belt. INDUSTRIAL GRADE Replacement Gear belt. 75 Teeth, 15" Pitch Length. 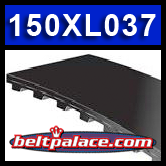 Popular replacement belt for power equipment such as Roybi belt sanders (BD4600, BD4601-G, etc. ), Martin Yale CV7, Pegasus water pumps, and robotic equipment. Replaces: Rockwell Table Sander RK7866 belt, RYOBI BD46075 Drive belt (Ryobi Part BD46075), Great Wall 150XL-037. Sears-Craftsman 2572ARY150 Drive Belt for Models: 137283290, 137215360, 319.22656 and 319226560. Replaces OEM CRAFTSMAN 226560049 BELT FOR BELT/DISC SANDER (Obsolete Sears Part). IN STOCK! SHIPS FAST FROM CENTRAL INDIANA. 150XL050 HTD Timing Belt. 15.0� Length, 75 teeth, 1/2� Wide. Neoprene HTD 150XL-050 Timing belt 150XL-050. Industrial Grade.